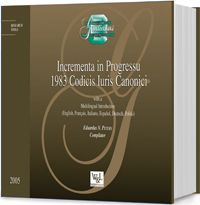 This book presents the complete textual history of the 1983 Code of Canon Law with line-by-line correlations, formatted for rapid identification in each successive version of the law. It is cross-referenced to coetus reports in Commiunicationes and to the Plenaria of 1981. The appendices identify the outcome of every numbered norm during the revision process. The text is in Latin with introductions and instructions for use in six modern languages (including English).